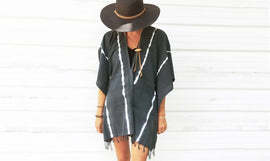 Cashmere Fringe Poncho: A loosely fitting festive poncho with fringe trim. This wool/cashmere poncho can be swept off to one side or draped like a cape. A wonderful travel piece.